Lucania, Velia AR Nomos. Circa 334-300 BC. Kleudoros Group. 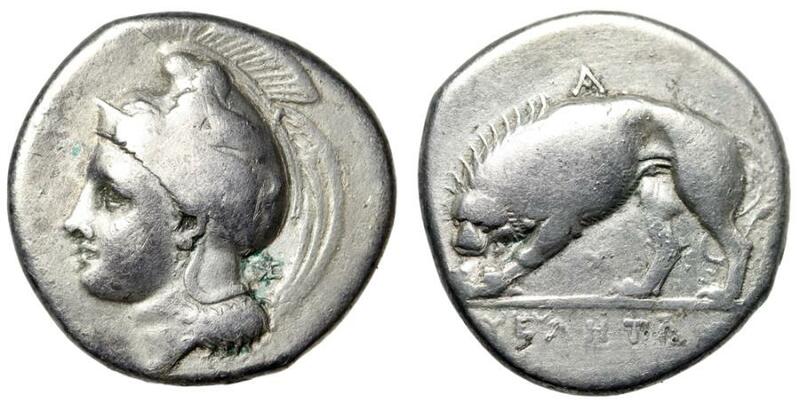 Obverse: Head of Athena left, wearing crested Phrygian helmet decorated with centauress; monogram behind. Reverse: Lion feeding to left; A above, monogram below. References: Williams 344 (O178/R251); HN Italy 1296. Size: 20mm, 7.39g. Professional Numismatic Notes: Good-fine and attractive! Calabria (Italy), Brundisium AE20 "Neptune, Nike & Trident / Taras on Dolphin"